A friend of my parents recently downsized into a new house. Her husband was deceased and, as you might expect, she wanted away with many old possessions that were no longer relevant and didn’t belong in the new place. I therefore became the willing custodian of her vast selection of wine books. Some of them were duplicates or previous editions of the current contents of my bookshelf – and in the case of Hugh Johnson’s World Atlas of Wine, I believe it’s the fourth of its kind! Many of them, however, were titles and tomes of which I had never heard and was looking forward to discovering. There was one book – a small and discreet hardback – which particularly stood out. Lest you take me for someone who could be swayed by a cover, no no, it was because of the musty smell that overwhelmed my nostrils. Even from a distance, the smell was strong to the point of being garish. Unable to ignore it any longer, I pick it up and look closer: “Dictionary of Wines and Spirits, 2280 Alphabetical Entries” by Pamela Vandyke Price. I really knew very little about this lady before finding this book and searching around on Google. She was at her peak before I was born. Her first book was published in 1966 and being, by all accounts, an utterly formidable woman, she went on to publish thirty more. I am delighted to have this most odorous of books in my collection, because just when I was starting to question what it means to be a woman in the wine industry, what future it could hold, and tracing the paths taken by women before me, these musty pages have fallen in my lap and reached out across the generational divide. “Vandyke Price will be remembered by many as a difficult, prickly character, whose put-downs were deadly and who raged more than was needful at the mutability of circumstance in a writer’s life. By way of contrast, she was fiercely loyal in her friendships and she really loved her subject. Her nose and her palate – though always better on reds than on whites – were impressive to the end. You may have noticed that I’ve taken a bit of a break from the blog. I’ve actually taken a break from most social media platforms because I’ve needed to turn off and disconnect in order to avoid being triggered by certain people, places or labels. It’s been more than 6 months since the judges found Marc Sibard guilty of harassment and sexual assault and more than five years since I handed in my resignation but I still have nightmares and recurring dreams. Just last night I found myself justifying to some imaginary character why I moved away from France. It’s not only inanimate objects that trigger my subconscious; even real people in real life will call me a storyteller or a money-hungry witch to my face. “Why did you make it all up?” they ask. I spend about an hour most mornings reading. It could be the news, some left-wing opinion columns or just a few blogs. If you didn’t know better, you would call me a slug-a-bed because I have nothing to show as a result of this “wasted” time. However, I find this habit deeply inspiring. Not always for the right reasons: there are some moments (like this) when I find the subject matter so infuriating and the words form so quickly that sparks fly off the keyboard. As an aside, for a glimpse into “The Parker Effect”, I highly recommend this 10 minute podcast with Jancis Robinson on the BBC. Having only started in the wine industry in 2010, to hear about the moment that the most influential US wine expert Robert Parker locked horns with UK goddess Jancis in 2004 was very interesting to me. Anyway, back to Bonné’s article, I’m going to take a few excerpts with which I couldn’t agree more passionately. “The more I thought about it, the more I had to acknowledge that our current fascination with expertise has actually made it harder to enjoy wine. Wine needs experts, of course, like any other pursuit. But rather than democratize wine, we’ve traded out reductivism for an infatuation with the mechanics and mystique of expertise. We move onto Bonné’s conclusions. I’d be lying if I said I hadn’t printed them out and pinned them to the wall behind my computer in order to remind myself of these home truths every day. Read the whole article on Punch by following this link. Marc Sibard, manager of the reputed Caves Augé shop in Paris, has been found guilty of multiple counts of sexual assault and sexual harassment and psychological harassment. Always at the top of any list of ‘influential people in the wine industry,’ Marc Sibard has been one of the most powerful advocates for natural wine in France. He has been at the head of the inimitable Caves Augé for over 30 years* and, in that time, has inspired, shaped and influenced a whole generation of consumers, sommeliers, winemakers but also, his employees. * Edited to add: On Monday 10th July, I heard whispers through the grapevine that Marc Sibard may no longer be employed at the Caves Augé… but these are not (yet) confirmed. * Finally: 31st August – it’s official. Marc Sibard has been fired. An article on Marc Sibard in la Revue du Vin de France last month. The headline photo also comes from that same RVF article. Enough was enough for several of those employees who went to the police and made accusations against him. After close to five years of investigations, the case was heard at the High Court in Paris (Tribunal de Grande Instance) on 9th June 2017. I was one of the plaintiffs. I worked at the Caves Augé and for the Lavinia group in 2011-12. In my case, the charges were for two counts of sexual assault and for sexual harassment. There are other two former employees, who also filed as “partie civile” and for them: further counts of sexual assault, sexual harassment and psychological harassment. Four other female employees had told, during the investigations, of similar problems they had had with him – which either had been settled out of court or brushed under the carpet. Today, July 6 2017, we found out that Marc Sibard has been found guilty on all counts; guilty of sexual assault, guilty of sexual harassment and guilty of psychological harassment. He now has a suspended prison sentence, has to stay off booze for two years and will have a criminal record… but do you know what, right now, the details haven’t sunken in. All my brain can process is that he has been found guilty, that the case is finally over and, thank God, it went in our favour. If you missed it, this was my (rather cryptic) blog post last month, musing about justice – here. I’ve been very quiet on the blog because it’s been a hard couple of months for me. I was back in Paris a week ago to testify in court against a very well-known figure in the wine industry. Because the verdict will not be pronounced until early July, I cannot make any of the details around the case public. One of the hardest things about last Friday’s hearing and of the five year procedure as a whole is the gut-wrenching, all-consuming desire for justice to be done. The hurt you endure when victim of a crime – the tears, the breakdowns, the hopelessness – while no longer raw, is carried around like a shadow that you cannot shift until you have the verdict. The endless statements at the police station, the questionings. “We’re counting on you to be strong,” an officer said to the teary-eyed, curly-haired ball, crouched on the Haussmannian street, hugging her knees outside the commissariat, during a pause in the confrontation in 2013. Now that the pain is no longer so acute, the main agony is actually due to the act of putting your faith in an unknown entity. You hope that he will be found guilty and therefore be made to suffer even just a fraction of what you went through. The anguish comes from it being completely out of your control; you don’t know who the judges will be and if they will be in any way understanding to your cause. Has the district attorney (procureur, in French) done enough? At the hearing, you just have a couple of hours to show who you are, convince them as best you can, and then wait to see what the result will be. Everything lies in the balance. Despite there being as many lawyers in Milano as in the whole of France, the system here seems different. Lawyers trade firmly worded letters as frequently as little yellow balls pass over the net at Wimbledon. Issues are more often solved out of court than in the presence of a judge. Within the viticultural sector in Italy, the stakes are even higher. The levels of jealousy, revenge and cruelty have shocked me in their ugliness. For having crossed someone, maybe having cut down a tree on a territorial boundary, sold wine to the wrong person or at the wrong price, matters will be taken into their own hands. In December 2016, a producer in Oltrepo Pavese’s property was broken into and the burglars opened the taps in the cellar, meaning that the equivalent of 400,000 bottles was poured down the gutter. It’s not just a one off, in 2012, a producer in Montalcino suffered an even larger loss – 60,000 litres of Brunello di Montalcino, which had an estimated worth of 13 million euros. I’ve spoken to a producer in Alto-Adige who was in the middle of harvest. He left his harvested grapes in a trailer in one side of the field while he went to pick the grapes on the other side… and during that small window of time, another person came up and poured petrol into the trailer-load of freshly picked grapes! It’s not unheard of for another farmer to come with a chainsaw in the middle of the night and destroy part of your vineyard, just over a small debate. Valuable cars have gone missing in Valipolicella in what the police believe is an inside job. Now, I know that militant groups in the south of France have done similar acts… but in the years I lived in France, I didn’t ever hear of it being so widespread as the stories I’m hearing now I’m in Italy, or if it were, it was for commercial gain rather than pure malevolence. Is Italy alone in this or are there other countries and wine-making regions in which this is an issue? P.S. This piece is no way intended to be an incitement to violence – I hope that is clear and will not be used against me in any future legal proceedings. It is just a reflection on contemporary society and cultural differences. #YoungtoYoung17: The Next Generation Will Be Female! 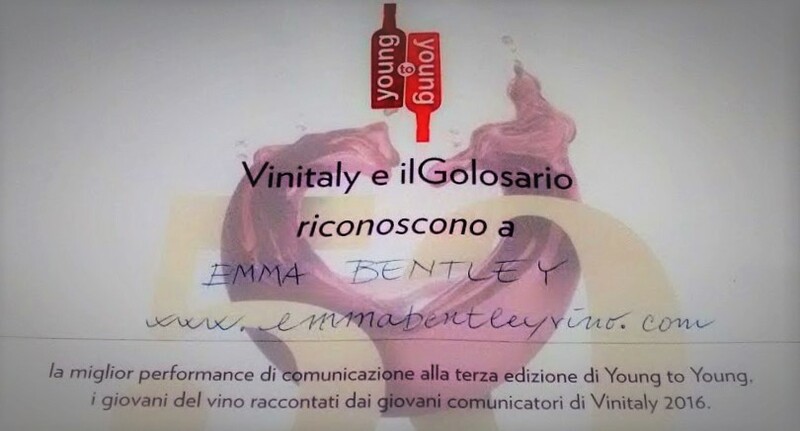 I was expecting to see ​Francesca Binacchi, from Poggio al Mandorlo at Young to Young this year but she had unfortunately been taken ill.
As it happens, I met her father instead and a very interesting discussion ensued…. He and his wife set up a winery in 2001. Originally from Lombardy, they fell in love with this area of Tuscany, 12 kilometres from Montalcino, near the Val d’Orcia, on the extinct volcano Amiata. Their local denominazione is that of “Montecucco” and if you don’t know of it yet, you ought to! I often find the sangiovese of Chianti difficult to digest – the tannins and wood barrels tough and chewy bedfellows. 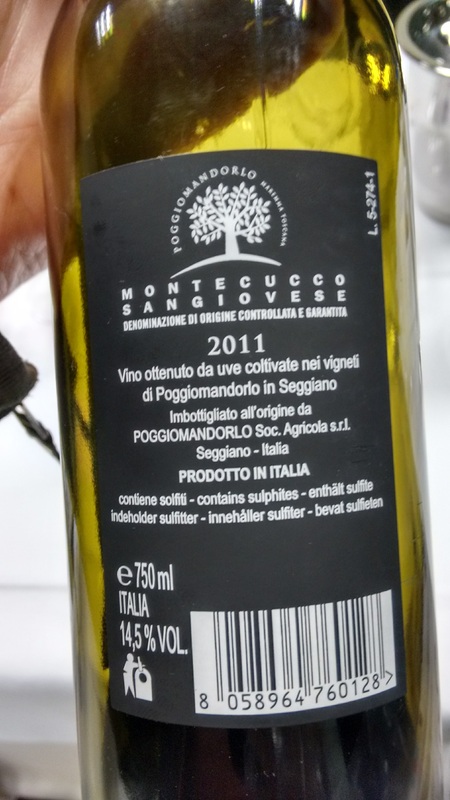 Montecucco’s expression of Sangiovese is that of freshness, elegance and very integrated tannins. Anyway, back to Francesca. She’s 20 years old and studying sciences at university. Passionate about wine and oenology, and importantly, the only daughter, she looks likely to inherit the winery when her parents retire. What I particularly liked, talking to her parents, was their conviction that a girl has the potential to take over a winery. It is far too common for a son to be the ‘chosen’ one to manage the estate – especially in such a traditional country as Italy. The right to be taken as seriously as a man is something I myself fight for all the time. They very much hope that Francesca will take forward their work. The Poggio al Mandorlo have 12 hectares of vineyards from which they make 40,000 – 50,000 bottles per year. (To put this into perspective, it’s a very small winery for the area.) Half of their production is what they call “territory wines” – i.e. made with sangiovese grapes; the other half are international blends of merlot and cab sauv. We tried Le Querce 2011. It was a very interesting wine. Wonderful red garnet colour, an enchanting nose of redcurrant jelly and wild herbs. The beautifully balanced mouth, remarkably fresh is full of prunes and pomegranates. The acidity is very typical of sangiovese with rounded tannins and an impressive salinity at the end, hailing from the mineral soils of the extinct volcano. As I mentioned before, sangiovese is not my variety of predilection but this particular expression I liked very much. I look forward to following Francesca’s progress over the coming years. Tasted at Young to Young 2017, during Vinitaly.